There are pedometers to measure how many steps you take each day. And iTunes keeps track of how many times you play a song. I’d like to hook up our picture books with read-o-meters to track how many times we’ve read some our books. I imagine we’re up to a hundred plus on some. 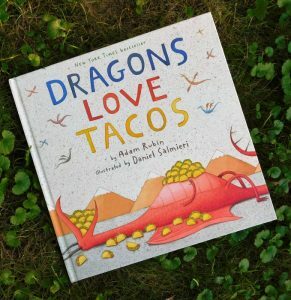 Dragons Love Tacos by Adam Rubin, illustrated by Daniel Salmieri is one of them. The story is simple. 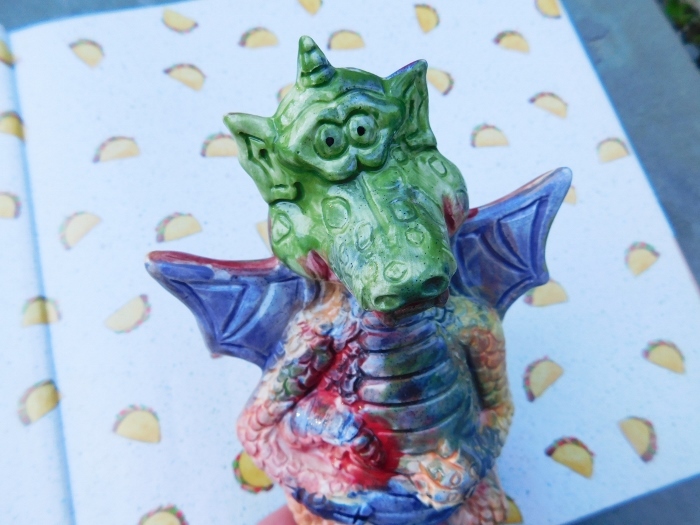 It turns out dragons love tacos, but not spicy salsa. That gives them tummy troubles. Dragons also love parties. So what better than a taco party? But what happens if, by mistake, there’s some spicy salsa. You’ll have to read it to find out. Now while repeated readings of books are good for kids, it is tough on the adults doing the reading. There are many options to mix it up from voices to having your kids read it to you, but with Dragons Love Tacos the boys and I have done something totally different. We’ve made up new versions. Dragons Love Hot Dogs—In this slight twist, we only change the beginning and keep the party part at the end. Dragons love hot dogs. They love mini hot dogs and foot-long hot dogs. They love hot dogs in buns and plain hot dogs as well. But they hate spicy sauce. Daddies love bacon. They love bacon for breakfast and bacon for dinner. They love applewood-smoked bacon and dry-cured bacon. But they hate their bacon in chocolate. This has made repeated readings of Dragons Love Tacos fun for everyone. Cam hears the story he loves. And CJ and I are challenged to come up with new ways to tell it. If you aren’t ready to come up with your own versions of Dragons Love Tacos or if there’s another book you find yourself reading over and over, here are some ideas for mixing it up. Ask questions and discuss the book. The reason why repeated readings are so important is your kids don’t catch everything on the first read. Each reading helps them notice new things and learn more. You can discuss questions like, “What did you notice when we read the book this time?” and “How would you react if this happened to you?” to help them get even more out of their favorite books. Read in different voices. I use high voices and low voices. I read with accents. Sometimes it sounds ridiculous, but it makes all of us laugh. And it models fluency, or the accuracy, speed, and expression books are supposed to be read with, which is one way teachers determine how well students read. Encourage your kids to read the book. Whether they can read, have memorized the book, or none of the above, giving your kids an opportunity to read will make them feel good. My three-year-old loves going through and “reading” a book. It is amazing how much he picks up from the pictures or remembers from a previous reading. And this “pretend reading” is preparing him for real reading. Ask your kids why they love the book so much. Then look for other books that have those characteristics. Also consider trying books by the same author/illustrator. We found that we love Secret Pizza Party by Dragons Love Tacos creators Adam Rubin and Daniel Salmieri. How do you keep those books you read over and over again more interesting? Hi! I’m Christine Fleming McIsaac—mom, wife, writer, and a marketer for educational publishers (the people who make the books and technology your kids use in school). My favorite thing to do with my two boys is cuddle up and read with them.